Physicists from the University of Basel have developed a memory that can store photons. These quantum particles travel at the speed of light and are thus suitable for high-speed data transfer. The researchers were able to store them in an atomic vapor and read them out again later without altering their quantum mechanical properties too much. This memory technology is simple and fast and it could find application in a future quantum Internet. The journal Physical Review Letters has published the results. Even today, fast data transfer in telecommunication networks employs short light pulses. Ultra broadband technology uses optical fiber links through which information can be transferred at the speed of light. At the receiver's end, the transmitted information has to be stored quickly and without errors so that it can be processed further electronically on computers. To avoid transmission errors, each bit of information is encoded in relatively strong light pulses that each contain at least several hundreds of photons. For several years, researchers all over the world have been working on operating such networks with single photons. Encoding one bit per photon is not only very efficient, but it also allows for a radically new form of information processing based on the laws of quantum physics. These laws allow a single photon to encode not only the states 0 or 1 of a classic bit, but also to encode a superposition of both states at the same time. Such quantum bits are the basis for quantum information processing that could make unconditionally secure communication and super fast quantum computers possible in the future. The ability to store and retrieve single photons from a quantum memory is a key element for these technologies, which is intensively investigated. A team of physicists led by the professors Philipp Treutlein and Richard Warburton from the University of Basel has now developed a particularly simple and fast quantum memory that stores photons in a gas of rubidium atoms. A laser controls the storage and retrieval processes. The technology used does not require cooling devices or complicated vacuum equipment and can be implemented in a highly compact setup. The researchers were also able to verify that the memory has a very low noise level and is suitable for single photons. "The combination of a simple setup, high bandwidth and low noise level is very promising for future application in quantum networks," says Janik Wolters, first author of the study. 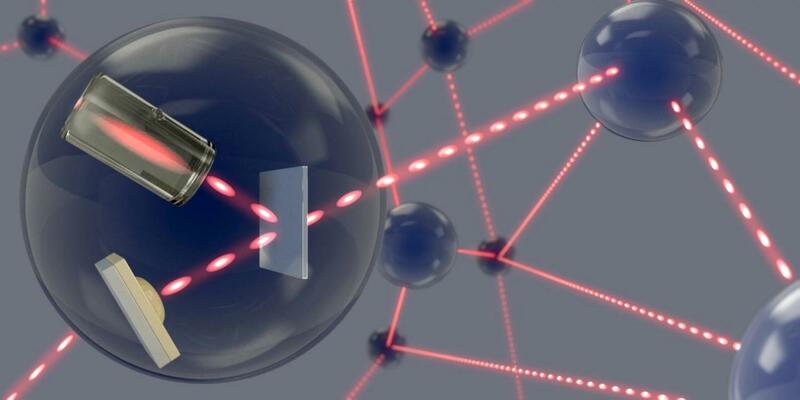 The development of such quantum networks is one of the goals of the National Center of Competence in Quantum Science and Technology (NCCR QSIT) and of the EU Framework Programme for Research and Innovation that have funded this study. In the future, quantum networks could lead to unconditionally secure communication, the networking of different quantum computers and the simulation of complex physical, chemical and biological systems.